THIS AUTHOR IS A LITERARY GENIUS! Hey ho, I decided that with the other good reviews and the bonus price it was well worth a read. I wasn’t wrong. It’s not a long book but it’s an interesting read. The story is set a long time after a zombie apocalypse and Azine is leading a bunch of mercenaries on mission to find some ‘prospectors’ that have gone missing. Azine’s bunch are basically a group of hired guns and the prospectors look for things from the old world prior to its disintergration after the zombies rose. The cool bit for me is that Azina is a female leader, but she is written very much like a man. It’s done very well. The other characters are also well-written and bounce off one another really well. Like I said, it’s a short book, but it zips along at lightening speed. Zombies haven’t been seen for a long time, but as they are searching for the prospectors, they uncover a hive of zombies and things start to happen pretty quickly from that point. 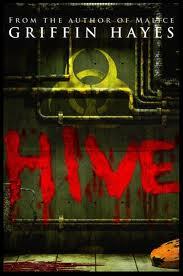 When I finished it I was delighted to see that there is a Hive II which I downloaded straight away. This is where I was a tad annoyed. The story develops well but the book ends at 79%. It is not only too short, but the author has added some chapters from another of his books in the remaining 31%. Now I understand cross-selling but it always makes me feel cheated when the book ends 2/3 through. I have heard that the author is working on the 3rd part of the Hive series and will combine into one book, which will make a lot more sense and make it into a more meaty sized novel. I do wish there was some sort of warning at the start of a Kindle book to say – look, this book ends at 79% so do not think you are getting more. All in all though a pretty good read and I’d like to get the 3rd book to see how it concludes. It’s a very interesting take on the zombie genre. It’s not the usual postapocalyptic world. Well, not on the outside anyway. I’ll try to not give away any spoilers here… There has been an accident at a secret US government facility in West Virginia and a several test subjects have been released/escaped with a necrotic virus. The government Homeland Security department closed down the whole area, which becomes Area 187. People are trapped there, some chosing to stay, but Homeland maintains quarantine and denies there existence. 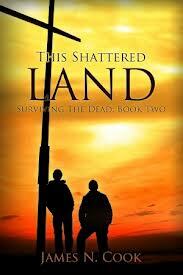 The story really isn’t your standard ‘the world has been destroyed by the zombies’ sort of book. 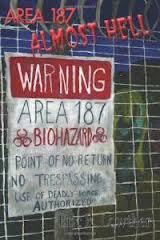 Only the people in Area 187 are really affected by the virus and its effects. Some journalists outside, and inside, the USA are trying to break open Area 187 and force Homeland to admit to forcing living US citizens to be trapped there. There are some interesting and different characters in this book. Some of written exceptionally well, and you really do not like them at their entrance into the story, but they develop so well that you really wouldn’t want them to die at the hands of Homeland or the zombies. Some good relationships are developed too. It’s also not a ‘happy ending’ book and bad things happen to good people. I like some of the new concepts too such as diggers. Like I said at the start, it was pretty meaty. It kept me reading. In fact I struggled to put it down. And, the sign of a good book – I felt a bit lost when I’d finished it. I will be checking out this author again as the story was original and the characters really well written and developed. 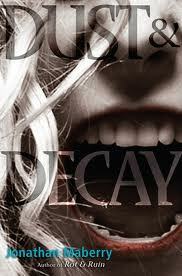 This is another book that I picked up to read as part of the Zombie Book of the Month Club on Facebook. Everything that have selected as the book of the month has been great so I knew it would be a goodie. It’s a YA (Young Adult) book but don’t let that put you off. If you’re into your post-apocalyptic fiction you’ll have no doubt read other YA books and really loved them. Think of His Dark Materials, The Hunger Games, Chaos Walking (The Ask and the Answer), Warm Bodies, or even Delirium. Fantastic books that are written for a younger audience, but still pack a punch that an adult will enjoy. 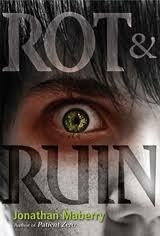 Well, the first book, Rot and Ruin, was the book of the month, but as soon as I read it I had to download the next book, and then the next book, and so on. you know what I mean! Once I start a series, I have to finish it. Now, onto the story. It’s 14 years after the zombie apocalypse and Benny is just about to finish school and needs to find a career. He was a baby when the first zombies started to rise (First Night) and was saved by his brother, Tom, but he resents his brother for leaving his parents. Tom is a bounty hunter and wants Benny to join the family business. The story introduces the world outside their town, the Rot and Ruin, and allows the poor relationship between Benny and Tom to blossom and grow as Benny understand more about what his brother does and what really happened on First Night. The second book continues the story and has Tom, Benny, Nix, Lilah and Chong trying to find the jet that they saw fly over in the first book. The group end up getting split and find that Gameland has been rebuilt and things are worse than ever. There’s a pretty sad ending to this book, so be warned! 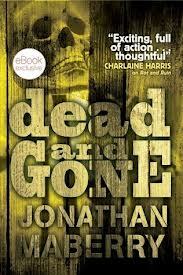 Dead and Gone is a shorter book and introduces Riot to the group of characters. It also brings in the Night Church and the Reapers. Riot, the Night Church and the Reapers feature heavily on the 4th book. 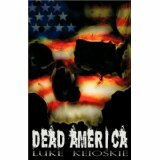 This one is a real page turner and expands the Rot and Ruin into other groups and cultures. Of course it ends with even more of a cliffhanger than the other books! Now, the first book I really enjoyed. Benny was a bit annoying at the start as he was just so angry with Tom but had never discussed First Night with him in 14 years… By the end of the book I’d grown to like him more and loved the relationship with him and Tom. The second book for me was a not as strong, but still a great book. But this is often the case with a series of books. There was a good building of characters and Chong and Benny bounced off one another really well. Nix is quite annoying and the ‘anger’ seems to be firmly in her court in this book. 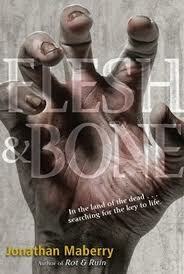 The 3rd book (Flesh and Bone) is fantastic though. 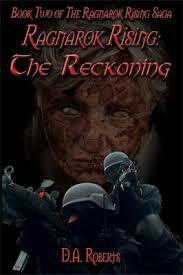 The addition of the Night Church and the Reapers pulls in a group that are more scary and dangerous than any zombie. By this book you know the main characters pretty well, but the introduction of new characters really adds to the book. This book also brings in the idea that the is a Sanctuary out there. Th e is a further book scheduled which will hopefully tie up the loose ends. And there were plenty at the end of Flesh and Bone. This is a fantastic series. Not the same level of gore as a standard ‘adult’ zombie book, but more focus on the character and relationships, and to be honest, the storyline (which can be missing from some blood and gore books). Oddly enough, the only character I found was lacking in roundness as Lilah. In the first book there is a lot of talk about the ‘Lost Girl’ and all the myths that surround her, but when you meet here, there’s not a lot of depth to the character. Riot was a much more rounded character and only featured in the last couple of books. It’s really just a minor quibble as the series really romps through. Every book is a real page-turner, especially the last book, which has the focus on a character or a group for each chapter, so you’re dying to read the the next chapter. Very cleverly written. This is prabably the first book I’ve read where you actually feel a little sorry for the zombies. The words of Tom echo through the books – ‘they were all once human’. Yeah, OK these are still zombies that will eat you and kill you, but they are pictured as more pathetic creatures who can’t really be blamed for what they are. This isn’t the namby-pamnby returning to humanity that you get in Warm Bodies, just a real sense of they are what they are, don’t kill them or torture them just for the sake of it. There’s more a dignity to them – when they aren’t moaning and trying to eat you! This book was recommended by Mark Tufo on his Facebook page. I believe that the writer is another self-published author, which always encourages me to try a new author. I’m glad I did. It’s a really good series. 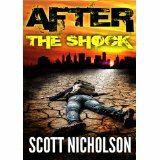 Of course, like most post-apocalyptic books, there is a survivalist or an ex-Marine or someone who was trained and prepared for such an event. The interesting twist with this book is that the main character, particularly in the first book, isn’t the survivalist. He’s a pretty wealthy guy who’s best mate told him that the world was going to end. His best mate is an ex-marine and former mercenary. Eric, due to some help from his friend Gabriel, is pretty well prepared when the dead start to rise, but after a while his stocks start to run out so he decided to go and join forces with Gabriel. This is mainly his story in getting there. The second book picks up from there and their journey from Gabe’s stronghold. The first book is mainly Eric, but I think the second book benefits from having Gabe headlining in the story too. Both books are real page turners and I really enjoyed racing through them . here were some pretty good, interesting characters – and of course a liberal sprinkling of bad guys. You really find yourself routing for some of the characters. Although this is a zombie book, there’s not masses of zombie gore, which is fine and fits with the way the book is written. I believe that there’s going to be a book 3, which I can’t wait to read. Bring it on Mr Cook!